I’m not advocating trading Alex Rodriguez because his skills may have diminished. I’m not convinced his poor showing late in the regular season and the playoffs is indicative of his new baseline level of performance, resulting from an irreversible decline in his skills. Didn’t we learn our lesson with Derek Jeter? At points during the second-half of 2010 and the first-half of 2011, there was convincing talk that we were witnessing the sunset of Jeter’s glorious career. Those perceptions proved to be wrong. Since the day Jeter registered his 3000th hit in 2011, through the end of the 2012 season—his last 224 games—he tallied an .806 OPS. This strong performance immediately followed a 145-game stretch when Jeter logged a puny .657 OPS. In the 2012 season, A-Rod posted an .806 OPS in 94 games before his hand injury. After he missed six weeks of action he returned for 28 regular season games and performed at a .710 OPS level. While his post-injury (including postseason) performance was clearly disappointing, it is far from a referendum on his future. I’m advocating trading Alex Rodriguez because it makes financial sense for the Yankees and gives them the flexibility they need to maintain a championship caliber team over the next several years. Aside from the debate around the expectations of A-Rod’s future performance, he has five years and $114 million in salary remaining on his contract. In addition, he is entitled to a potential $30 million in milestone bonuses for achieving various historic home run totals, beginning with his 660th HR (he currently sits at 647). While this is what A-Rod is owed, it does not fully reflect the true cost to the Yankees. Let’s acknowledge that the Yankees will likely be in a 40% or even 50% luxury tax bracket for the life of Rodriguez’s contract. This means they may end up paying out over $200 million for the remaining 5 years of his deal, including the marketing incentives for achieving his milestone HRs. The Yankees seem to have an aspiration to duck under the luxury tax threshold for at least one year—and for good reason. Doing so would put significant dollars in their pockets. Not only would they save money by not paying the maximum luxury tax rate, they would also reset their future tax rate to a modest 17½% , should they exceed the luxury tax threshold in a subsequent year. In addition, if a team is below the luxury tax threshold, they are entitled to additional shared revenues from MLB. Shedding A-Rod’s salary and marketing incentive obligations could be the key to allowing the Yankees to get below the luxury tax threshold in 2014, when it escalates to $189 million. There are two ways the Yankees could attempt to deal A-Rod. One approach is to eat a modest amount of his future compensation. Perhaps if the Yankees pay $50 million—the equivalent of $10 million per year—of his remaining $114 million in salary, they might generate interest from a few MLB teams. This would allow them to ship A-Rod to another club with a $13 million per year salary obligation, plus the possibility of another $30 million in incentives for historic HRs. Under this scenario, New York would likely not command much in return, in the form of players or prospects, but they would reduce their $27.5 million (plus any incentives they payout) annual charge against their luxury tax threshold to $10 million per year. This gives them a fighting chance to get underneath the $189 million annual payroll, or at least redeploy the payroll dollars more efficiently towards more productive assets. The second approach is more aggressive—a scenario where the Yankees eat more of A-Rod’s compensation, say $15 million per year, but position themselves to acquire a highly ranked prospect in return. If they leave their trade partner with a more manageable $8 million per year salary obligation, plus the potential incentives, they should also be able to acquire a top prospect or a young, high ceiling player with less than a year or two of service time. This could further aid their attempt to get under the luxury tax threshold—adding an inexpensive, but productive player. Regardless of the Yankees trade strategy, A-Rod would need to approve any deal, which will not be easy to accomplish. Rodriguez would perceive any exit from New York as a personal embarrassment, which is an important consideration for someone who seems highly concerned about other people’s perceptions. The Yankees would need to convince A-Rod that life will be even more miserable if he stayed, than if he left. The Yankees’ treatment of A-Rod during the playoffs helps their cause in this regard. They certainly showed they are capable of embarrassing him. The right trade partner may help sway A-Rod. Perhaps a small, home run-oriented ballpark that increases the likelihood that Alex reaches his HR milestones and hence, baseball immortality, will raise the appeal a trade scenario. Bottom line—this is more about an arbitrage opportunity on the luxury tax threshold, than it is about Alex’s talent level. A-Rod is an asset that might cost the Yankees $200 million over the next 5 years—a staggering $40 million per year—plus the opportunity cost of sharing in additional revenues and lowering their luxury tax rate in future years. The same A-Rod would cost another team between $40 million and $70 million less—the equivalent of the Yankee luxury tax payments. This equation means the Yankees should be willing to pay a chunk of dollars to subsidize A-Rod’s cost to another team. There seems to be plenty of room to create a win-win scenario for the Yankees and a trade partner. It’s making the equation work for Alex that’s the tough part, but the Yankees have done a nice job of laying the groundwork. In a recent post I discussed my analysis of the why some hitters bring their “A” game into the postseason, while others seem to take it down a notch or two. My analysis does not deal with a player’s makeup or psyche, or how they handle pressure, nor does it have anything whatsoever to do with the topic of clutch performances. I’m coming at this from a different angle, with a data-based look at how hitters perform against different strata of pitching quality. The reason this analysis may have implications for a hitters’ postseason performance is the quality of pitchers in the postseason differs (by a lot) from regular season pitching. My hypothesis is simple—hitters who have a track record against top pitchers will survive or even thrive in the postseason, while those who are systematically beaten down by top pitchers will have a tough time shining in October. On average, hitters follow a pattern—they perform at their average level versus “average” pitching, better against “weak” pitching, and worse against “top” pitching. Using OPS as a calibration point, hitters hit about 80 to 100 points lower against the top one-third of starting pitchers and about 80 to 100 points higher against the bottom 33%, on average. Not everyone follows the same pattern. 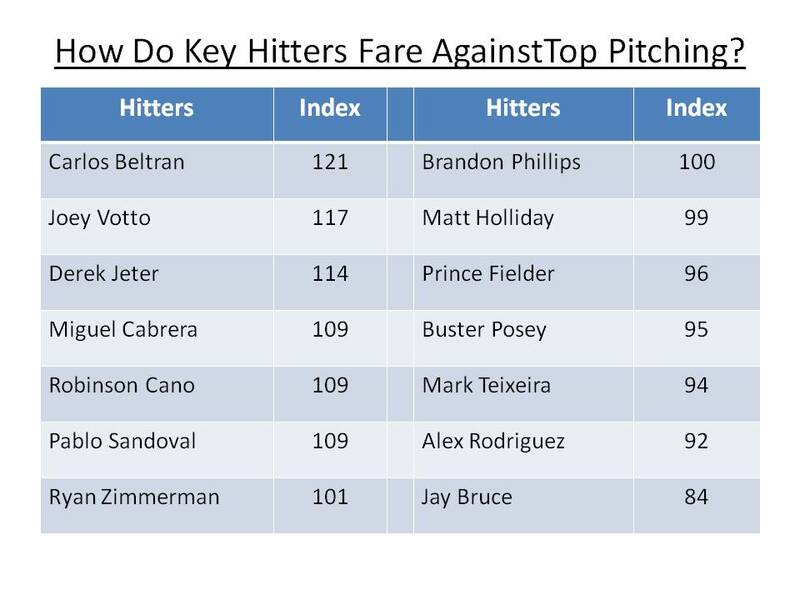 Some are particularly effective against top pitchers and hit only marginally better against weak pitching. Others have the opposite profile—they exploit weak pitching, while being stifled by top pitching. Alex Rodriguez profiles in the latter group. Because postseason pitching tends to be comprised of more top tier pitchers, (see my previous post) we can expect players like A-Rod to produce at a lower level during the postseason. Let’s compare Jeter and A-Rod’s actual postseason performance over their career. We can’t simply look at all regular season stats vs. postseason stats, since a player may have reached the postseason in his best or worst hitting seasons. Instead, I weighted the player’s regular season OPS based on the number of plate appearances in each year they reached the playoffs. This gives us more of an apples-to-apples comparison. For his career (prior to this postseason), A-Rod have a blended average .945 OPS for the regular season and an .884 OPS in the postseason—a downgrade of 61 points. Conversely, Jeter’s regular season numbers are .830, with a postseason OPS of .839. Here’s an instance where the actual performance, over a 15-year career, supports the analysis of who succeeds in the playoffs. Over the course of a postseason a player may have a hot or cold streak, so the small sample size means this framework may not translate in the short run. A-Rod proved that with his 2009 postseason as he carried the Yankees to a World Championship. Nonetheless, the approach of determining whether or not a hitter crushes (or flounders) against top pitching may provide a window into their postseason performances. A week or so ago, Bill Madden of the New York Daily News wrote a piece about SABR Geeks Sabatoging Cy Young and MVP Races. (Incidentally, Bill is a long-time SABR member.) His main concern is that new age stats may interfere with granting the awards to his choice of deserving candidates, namely R.A. Dickey for the NL Cy Young award and Miguel Cabrera for the AL MVP. The “R” in SABR stands for research and implies a level of objectivity and analysis. While it is true the some in the SABR community tend toward the numbers, there is at least an equally strong group at SABR who worship the history of the game and past precedent. Not all SABR people would agree on who the Cy Young and MVP winners should be, but we love to debate the merits of case for the various candidates. Mike Trout—he had one of the great seasons in modern times. According to Baseball-Reference.com’s WAR (wins above replacement) stat, only 3 players produced a better season in the last 40 years–Barry Bonds (2001, 2002), Cal Ripken (1991), and Joe Morgan (1975). What makes Trout even more extraordinary is he accomplished this in his age-20 season–an age when most would be major leaguers, including future Hall of Famers, are toiling in the low minor leagues. Bryce Harper—while Harper’s season was overshadowed by Trout’s accomplishments, no 19 year old in history, not even Mel Ott, accomplished what Harper did this year. According to the same WAR stat, Harper generated 35% more all-around production (offense, defense, baserunning) than Ott’s 1928 season. Offensively, one would need to give the edge to Ott, and perhaps Tony Conigliaro’s 1964 season, but still not bad—the 3rd greatest offensive season by a teenager in the last 90 years. Craig Kimbrel—last season’s NL Rookie of the Year has outdone himself in his sophomore season, by striking out more than 50% of the batters he’s faced—an all-time record. In 62.2 innings pitched, he K’d 116 of the 231 batters he faced, while allowing only 27 hits. His dominance over hitters resembled Eric Gagne’s Cy Young year with the 2003 Dodgers, when Gagne K’d 45% of the hitters he faced. Miguel Cabrera—winning the Triple Crown, which no one has done since 1967 is a tremendous feat. The stars were aligned for Cabrera this year as he registered a lower OPS than either of the last two years, but managed to lead the AL in the three triple crown categories. Notwithstanding, there’s no knocking a .999 OPS, 44 HR’s and 139 RBI. Derek Jeter—his accomplishments in 2012, much like Bryce Harper’s are noteworthy in the context of his age. Jeter recorded the most hits in any age-38 season in baseball history, with 216, topping Pete Rose’s 208. Only Paul Molitor’s 225 hits in his age-39 season top Jeter’s in the over-37 crowd. Making it more historic is that Jeter accomplished this offensive feat while playing the demanding shortstop position and leading the major leagues in plate appearances, all very impressive for a 38-year old. Bill Madden is not alone in thinking that an historic accomplishment such as a triple crown should automatically translate into an MVP award, making Cabrera’s season the most misunderstood of the five great 2012 season-performances. As we learn more about baseball through the analysis of data, we recognize that batting average and RBI’s—two of the 3 triple crown categories—are not particularly informative in describing a hitter’s contribution to his team’s performance. The single most important thing a hitter can do is to avoid making one of the 27 precious outs in a game, which suggests a revised triple crown to include on-base-percentage, rather than batting average would make for a more informative measure. Runs-batted-in are even more suspect (than batting average) in judging a player’s offensive contribution and are largely dependent on the teammates around the player in question. A high RBI total are often the result of an abundance of RBI opportunities. Perhaps slugging percentage, instead of RBI, would focus the triple crown on measures that a hitter can control. Another matter working against Miguel Cabrera’s candidacy for the MVP award is that the triple crown ignores defense and baserunning, focusing only on hitting. Given the length of time the triple crown has been around and the state of defensive measures back then (i.e., fielding percentage), it’s no surprise that fielding is not included. In recent years, new statistics have illuminated the value of fielding and helped rate and rank fielder defensive performance. Trout (along with Michael Bourn) is among the top center fielders in all of baseball, while Cabrera is kindly referred to as a below average fielder. If we were talking about a “player of the year” award, I would expect Trout to run away with the designation. Since we are talking about a most “valuable” award, many will consider that Cabrera’s Tigers reached the postseason, while Trout’s Angel’s fell short—perhaps because they called him up to the big leagues too late. I believe there is a case for MVP for both players, but I would easily favor Trout, while appreciating the case for Cabrera. In expressing his concern over the NL Cy Young award, Bill Madden does not declare the reason for his fear that Dickey may not win the favor of the SABR crowd. I would expect the statistically-minded to rank Dickey high on their candidate list. If we evaluate a starting pitcher based on the things we ask him to accomplish—efficiently prevent runs—then R. A. Dickey ranks atop the list of candidates, along with Clayton Kershaw. I expect Dickey’s W-L record advantage will serve as the tiebreaker versus Kershaw. The one legitimate fear Dickey (or Madden) should have is the historic season by Craig Kimbrel. He will certainly (and deservedly) secure his share of votes. In fact, in the absence of Dickey’s outstanding season, I would expect Kimbrel to win it, but the voter’s bias toward a starting pitcher should be enough to give Dickey this year’s NL Cy Young. As we contemplate and celebrate the postseason awards for the next 6 weeks, let’s not forget to cherish this year’s performances of Mike Trout, Bryce Harper, Craig Kimbrel, Miguel Cabrera, and Derek Jeter. They made this summer a lot more fun. Everyone wants the opportunity to showcase their talents to the right people. That’s exactly what the Diamond Dollars Case Competition at NYU is all about. Undergraduates, as well as graduate students from B-Schools and Sports Management programs, will compete against each other by preparing an analysis and presentation of a real baseball operations decision–the type of decision a team’s GM and his staff is faced with over the course of a season. Five-person teams of students are asked to evaluate proposed player transactions, apply statistical analysis of player performance and assess the financial impact of the team’s proposed moves. I will author the case, drawing on my experiences of working closely with front office executives helping teams analyze key baseball operations decisions. Once the student team has prepared its case, they will have the opportunity to present their analysis and recommendations to a group judges, which will include MLB front office execs and members of the media. They will have a dialog, receive feedback and ultimately be evaluated, by this panel of judges, based on the quality of their insights and analysis. The Case Competition is a perfect fit for the avid fantasy player who believes they can match strategy with baseball execs, or for anyone who aspires to work in a Major League front office. It’s also a great opportunity to apply the critical thinking skills students hone in their academic curricula and apply those skills to real world problems and to demonstrate their talents and network with current execs and other baseball industry insiders. The event at NYU is an opportunity for New York metro area schools to compete in an event that was an overwhelming success in March of 2012 in Phoenix. The winner of the 1st Annual National Case Competition, held on March 15-17, 2012 at the SABR Analytics Conference, was the University of Chicago–Booth school, with the undergraduate division honors going to Yale University. Case participants had the opportunity to present their case to judging panel comprised of MLB team executives. Fourteen student teams entered the inaugural Competition. 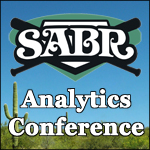 Eighteen MLB teams attended the Case Competition and SABR Analytics Conference, along with numerous media executives, industry suppliers, providing ample opportunity for networking with industry insiders. Two participants from the March 2012 Competition were able to secure internships within MLB. For the NYU event, the case will be distributed to student teams several days in advance of the November 2nd presentations. On the morning of Friday, November 2, student teams will assemble at the NYU Kimmel Center at Washington Square in lower Manhattan and present their case recommendations to a panel of judges. The 30-minute time slots for each team will include a 20 minute presentation and a 10 minute Q & A by the judges. After the conclusion of the presentations the judges will select a winning team. The 8:30am to 2pm event will conclude with speakers and a panel discussion by baseball execs and industry insiders, giving participants a chance to network.